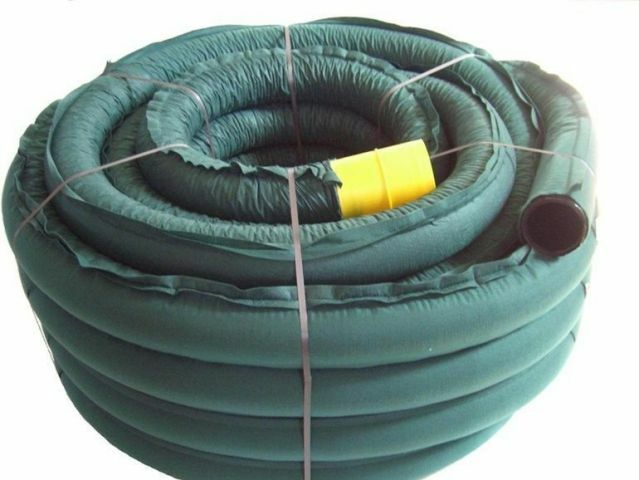 Double wall polyethylene corrugated pipe in coils, for electrical and telecommunication installation. Compliant to CEI EN 61386-24 standard and with the directive B.T. 2006/95/CE. Pipes have the IMQ mark issued by the Italian Institute for Quality Mark, especially for international cetification of electrical installations. Double wall corrugated pliable conduit, sizes from Ø 40 to 200 - gray. Double wall corrugated pliable conduit, sizes from Ø 40 to 200 - red. 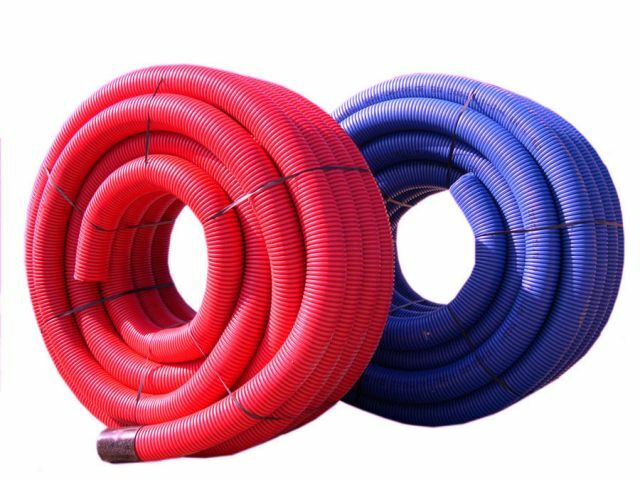 Double wall corrugated pliable conduit, sizes from Ø 40 to 200 - blue. PEAD joint sleeve, sizes from Ø 40 to 200. Furthermore, we provide polyethylene corrugated pipes for drain systems. In coils of 50 meters each (25 meters for Ø 200 only). Manufactured in high density polyethylene delivers resistance to UV rays for at least 6 months. PE corrugated pipe for drain - green coloured, sizes from Ø 63 to 200. Great flexibility and extremely simple junction sleeve. The excellent technical and market performances provided in the implementation of drainage systems in the agriculture and construction sectors, in the reclamation of lands hit by hydrogeological instability, in the design and installation of drainage systems for sporting facilities, make this product an increasingly important point of reference. It is available in coils of 50 meters each including a sleeve joint. Pre-coated corrugated drain pipe, sizes from Ø 63 to 200 - green coloured. Special fittings range for drainage systems, such as: sleeve - 45° branch - double 45° branch - 90° tees - 90° double tees - internal plug - external plug - sizes from Ø 63 to 200 mm.